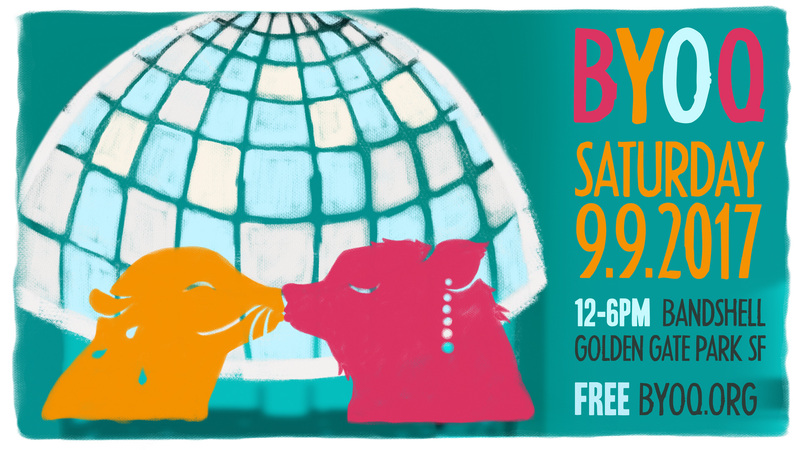 Bring Your Own Queer (BYOQ) is a free daytime LGBTQ music, arts and performance festival featuring some of the Bay Area’s most dynamic queer DJs, performers, visual artists and community organizations! It’s all happening at the Music Concourse Bandshell in Golden Gate Park (in between the De Young Museum and The Academy of Sciences) from 12PM to 6 PM on Saturday, September 9, 2017. This year we will feature: Oakland’s sassy and soulful dance party Soulovely, delightfully sinful beats from Polyglamorous, as well as DJ sets from genre and gender bending Hunnies & Hot Sauce; live performances from the explosive and visceral Latinx sensation SanCha y Las Sirenas (Los Angeles), a reading with queen Yves St. Croissant and face painter Bayley Van of the internationally acclaimed Drag Queen Story Hour, the evocative alternative folk and soul music of Bay Area native Azuah, the powerful and soulful drag sensation Dulce de Leche, post binary drag socialist Hollow Eve, old skool hip hop drag king group Momma’s Boyz, and a Leatharcore fashion show by fetish couture designer Apaulo Hart. We’ll also feature a photo booth by Shot in the City Photography, and a myriad of community organizations including Openhouse, the Queer Ancestors Project, the Queer and Trans Youth Treehouse, and Huckleberry Youth.